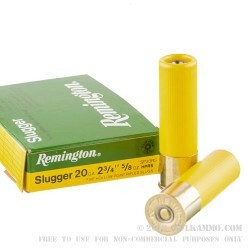 A very simple and straight forward performance 20 gauge shell. 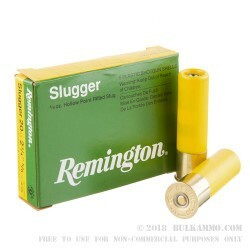 This Remington Slugger 20 gauge is a great large game load and offers versatility to your favorite shotgun instantly. The load features a rifled slug in 20 gauge and offers 5/8 ounce projectile of lead that has great knockdown power and consistent flight characteristics to turn your smooth bore shotgun into a deer slug gun instantly. At distances more than 50 yards out even, this is an effective shell for use when conditions change, or for those looking for a challenge, while still being a responsible big game hunter. Remington has been producing this load for decades. But more than that, Remington has been excelling in the consumer market for producing top quality ammunition for hunters and shooters everywhere. 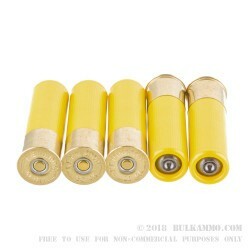 The brand name and the reliability that are inherent to it, cannot be discounted when selecting a shotshell. This cartridge has a lot of subtle features and quality components that just make it a very good choice for the 20 gauge shotgun shooter. A potent 1580 feet per second velocity and a strong 1510 ft. lbs. of energy delivery makes this a great game round.